Tony Vicari, manager of the Durango-La Plata County Airport, started working in operations at the airport in 2014 before landing the top job. He is overseeing small, incremental improvements to the airport after voters declined to approve a $40.4 million bond issue. Tony Vicari, manager of the Durango-La Plata County Airport, does what he can to help out around the facility, but he has less time for day-to-day projects after taking the top job at the airport. For Tony Vicari, managing the Durango-La Plata County Airport is the ideal job in an ideal locale for someone who likes to spend time on trails, whether it’s wearing hiking boots in the summer or ski boots in the winter. The outdoor opportunities are part of the pitch the airport makes as a regional attribute when it tries to lure new airlines to Durango. “It takes a lot to bring in a new airline, but it’s part of the equation,” he said of efforts to bring in another carrier. 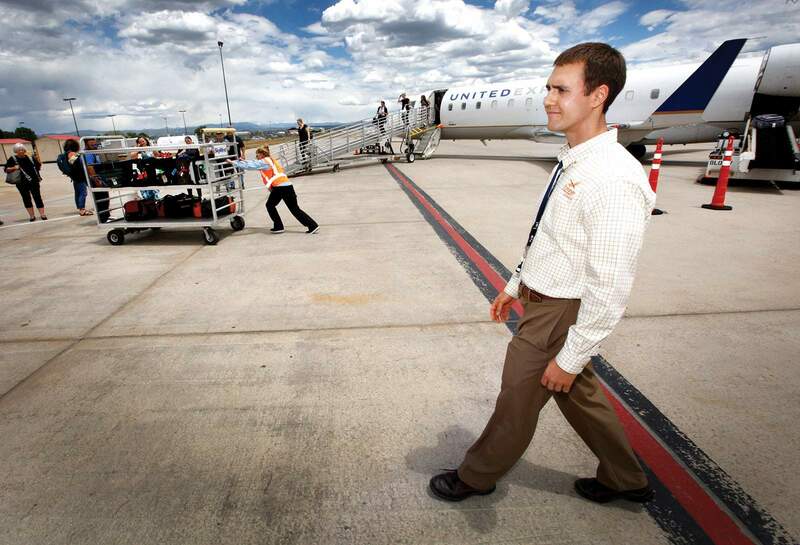 Vicari, 30, came to Durango’s airport in 2014 to serve as operations manager. He assumed the title of interim aviation director in 2016. The word “interim” was removed from the title in April 2017. The airport also houses the Durango Air Tanker Base, which is still servicing two fixed-wing air tankers and two Chinook Helitankers working to douse the 416 Fire, said Craig French, manager of the base. 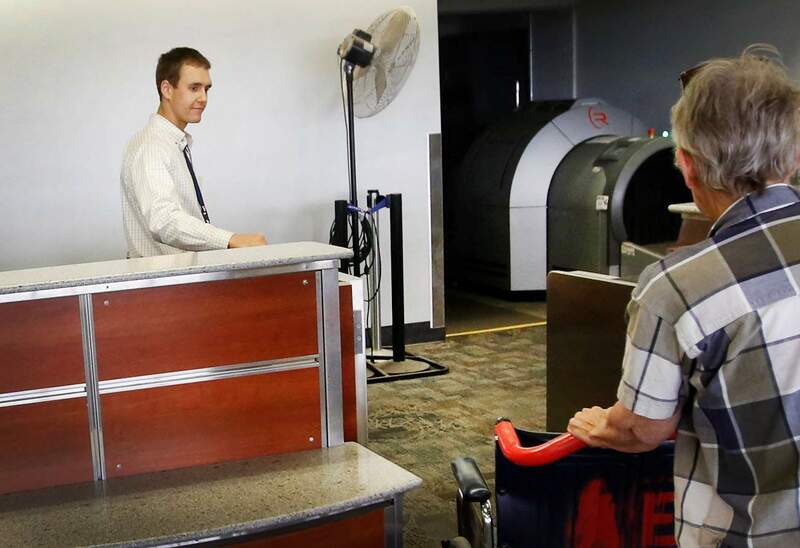 Jack Llewellyn, executive director of the Durango Chamber of Commerce, said a well-run airport helps Durango house firms such as WorldPay and StoneAge, firms that otherwise would be looking at cities like Grand Junction to base their operations. The airport has seen a steady rise in usage. In 2017, total passenger numbers hit 372,327 – a 61 percent increase from 2008 passenger numbers. To deal with the growth, Vicari said the order of the day is keeping the airport on sound financial ground so it can tackle the most-pressing priorities one at a time with existing revenue sources – like a homeowner staying one step ahead of maintenance needs. In reality, airport administrators and the Durango-La Plata Airport Commission have little choice. In 2016, voters by a wide margin – 18,541 “no” votes to 11,556 “yes” votes – rejected a proposal to back $40.4 million in bonds to help pay for a new $85 million terminal. The remaining money to finance the terminal would have come largely from the federal government with some state funding. Instead, Vicari said the airport needs to figure out how to use existing revenue streams to maintain existing infrastructure and to make strategic improvements to deal with growth. An example of a strategic improvement to deal with growth is the remodel of the ticket counter that will begin in late August or September. The project, estimated to cost about $830,000, would add about 4,500 square feet for a new baggage-handling facility that would also create more efficient baggage checking by the Transportation Security Administration in phase I. In phase II, the existing area behind the wall of the current airline ticket office will be remodeled to separate office functions from the garage functions, with those operations moved to the new baggage-handling facility completed in phase I. Not only will the project make life more comfortable for the airline employees, it will add a new leasable third slot to the ticket counter for another airline and potentially add new revenue. “One big request we have from the community is to diversify service, and one obstacle has been the lack of space for another carrier at the ticket counter, and we’re hoping to present a turnkey operation to another carrier interested in Durango,” Vicari said. It’s small projects like the ticket counter addition and remodel that many may have missed since the defeated bond measure. Currently, the north end of the taxiway is being renovated, paid for by $2 million in Federal Aviation Administration funding. In the past two years, the airport has added 42 paved parking spaces in the credit card lot and 60 spaces in the overflow lot to address a parking shortage. The rental car lot is being repaved and the main lot will be repaved in September. The terminal has new carpeting and its own updated Wi-Fi system. The old, stained cloth seats are gone. Next year, Vicari is looking at bathroom remodels. “Little things add up to an overall easier and more comfortable flying experience,” he said. The small remodels are tackled within the airport’s $3.4 million operating budget, and the fund balance for the airport is at $3.2 million – almost equal to one year’s expenses. The loss of the bond issue has forced a close look at the airport’s fees, rates and revenues, and Vicari said the airport is conducting a rates and charges survey to ensure it is competitive with similar airports. After a year on the job, Vicari said he is getting better at delegating projects to his staff and stepping away from daily operations. The airport keeps Vicari busy, but he plans to take a break in September when he will marry Chris Harlow of Durango. Their first date was on Skyline Trail on Raider Ridge. He expects about 100 friends and relatives will be able to offer him a critique of the airport he runs when they fly in for the ceremony.